MagTech is some of the BEST you can buy at any price! This is my 2nd purchase of 1000 rounds. First order was for 115 grain this most recent order was 124 grain. My recent order was delivered in less than 3 days. 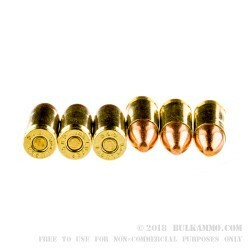 I use this ammo in my FNS 9mm and my XDE 9mm and have had no issues at all. The 124 gr has been shot out of a Glock 17, Glock 26, and Beretta Nano. A friend and I put 700 rounds of Magtech 9mm ammo through his Glock and and my CZ without a single issue. The ammo was on sale when I bought it and I was so glad that I did. This is quality ammo and the delivery service was very fast. This is great ammo. No functionality problems. Accuracy is pretty good and a great price. This and the Armscor 124gr are at par with each other. I'd buy more of both. I have shot about 800 of the 1000 I purchased. I have not had any missfires or jams. I shot an idpa competition last weekend and had zero problems with the ammo. Q: Is this brass reloadable? A: Yes, this is re-loadable brass. 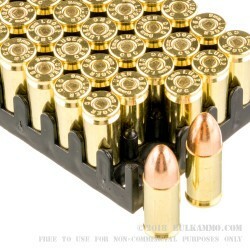 Q: What is the weight of a Magtech - 124gr FMJ box with 1000 rounds? A: Hello Lenio, The weight of this specific 1000 round product is 28.97 lbs. A: Hello Eric, These 124gr. FMC rounds by Magtech in 9mm have a muzzle velocity of 1109 fps. They make great target rounds in 9mm. A: Hello Ron, These 124gr. FMC rounds by Magtech in 9mm have a muzzle velocity of 1109 fps and a muzzle energy of 339 ft.lbs. The 124gr. FMJ rounds by S&B in 9mm have a muzzle velocity of 1181 fps and a muzzle energy of 382 ft.lbs. The Magtech rounds are just slightly slower than the S&B rounds. S&B manufactures their ammo in the Czech Republic, and Magtech manufactures their rounds in Brazil. 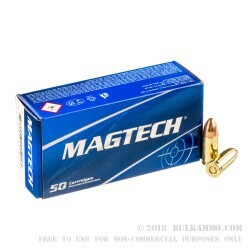 These Magtech rounds are great for target shooting and are excellent quality. Q: Are these brass previously fired? A: This brass is factory new and has not been remanufactured from once fired brass. There may be tarnishing and discoloration from the factory cleaning and annealing process to strengthen the brass during the manufacturing process. The lack of divits and wear marks on the extractor groove (located above the primer) will indicate that this brass is unfired.